The World of Peachtree Publishers: Happy 100th Day of School! For many of you out there, today marks the 100th day of school! You're over the halfway mark! Well done! Celebrate with a reading of Jake's 100th Day of School! What will Jake do when he forgets to bring the special collection he's going to share at the celebration of the 100th day of school? I remember scrambling all over the house for the perfect thing to bring when I was a kid ― no easy task, especially at 7:40 a.m., which was historically when I'd remember that it was the 100th day of school. (Cereal has many uses.) So, good luck out there! I hope you didn't forget like Jake and I did! 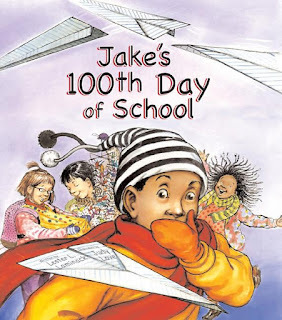 Want to win your own copy of Jake's 100th Day of School? Leave a comment with your email address and answer: What did you bring to school for the 100th day? I'll pick a winner on Friday! Happy Reading Everyone! And Happy 100th Day of School!